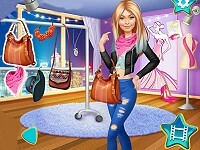 Barbie has a new dream, to become a successful fashion designer. She's very creative and talented and that's why she has a notebook in which she draws all her inspirations. She's planning to design a new and different outfit idea for each day of the week for example casual diva, glam gorgeous, lady and dots, vintage chic or pretty in geek. Help Barbie to recreate the outfits based on her sketches. 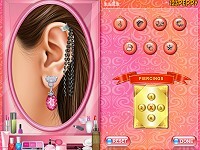 Spin the wheel and then create the Barbie's fashion style that you've got. For the glam gorgeous outfit you'll need to find a short black glitzy skirt, a casual white top, a pink handbag and black high heel shoes, for the casual diva you'll have to combine a pair of blue pants and a white top matched with a scarf, glitzy black high heels and a black handbag. The idea is to make sure that you'll create all the styles based on Barbie's sketches. 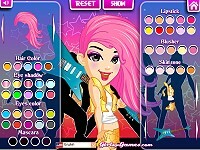 Have an amazing time playing this awesome new free online flash Barbie fashion designer & dress up game for girls here in Minigames.com! 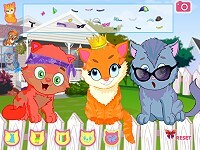 Use your mouse to dress up Barbie.